To celebrate KISS's End Of The World Tour, Classic Rock is proud to publish this world exclusive magazine bundle, limited to only 250 copies worldwide. 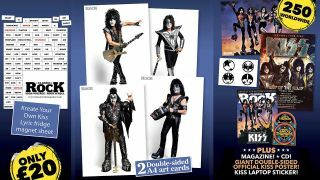 The bundle includes two double-sided A4 high quality art prints, a set of fridge magnets which which to create your own KISS-themed messages, a giant double-sided poster (featuring Kiss's classic Destroyer artwork on one side and the official poster for the UK leg of the band's End Of The World tour on the other), and a laptop sticker. This all comes bundled with the current issue of Classic Rock magazine, in which we get exclusive, behind-the-scenes access to KISS on their farewell tour.